If you’ve ever tried to repair consumer electronics on your own, you’ve almost certainly run into the nightmare that comes from using standard issue tools, like your everyday Phillips screwdriver. Most electronics -- from handheld devices to larger units like gaming consoles -- come sporting their own specialized fasteners. This makes just getting inside your device a fairly significant challenge. Plan now for your next electronics repair with the handy iFixit 64-Bit Screwdriver Kit, your access key for getting inside a host of today’s most popular smartphones, game consoles, and other small electronics. While the iFixit kit comes sporting all the tried-and-true screwdriver bits like multiple Phillips and flathead sizes, that’s just the tip of the iceberg. 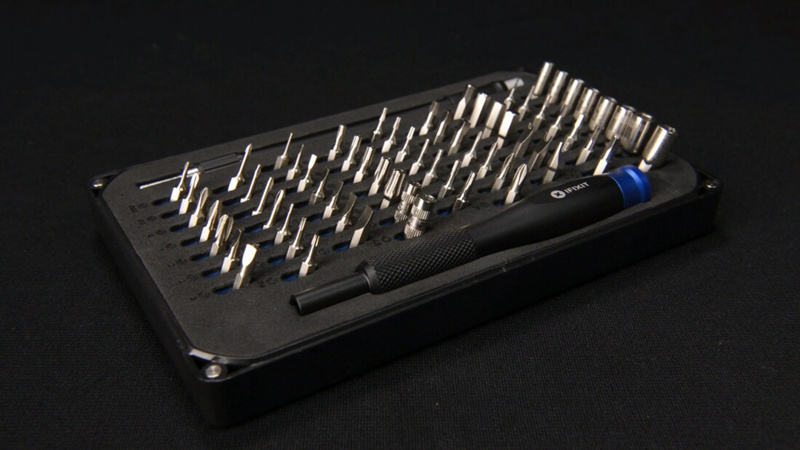 Dig into its massive bit set, and you’ll find tips that’ll get you around most of the trickier screws and fasteners you’ll encounter, including Torx, Pentalobe, Hex and Tri-point screws. Along with a full set of bits, the iFixit also packs two other items for the do-it-yourselfer: a 150mm flexible extension for getting to hard-to-reach hidden screws; and a SIM card eject tool that’ll help you dislodge a SIM card from your phone without wrecking your device. You won’t realize how invaluable these little helpers are until you have them. Get the iFixit 64-Bit Screwdriver Kit right now at $34.95 - 30% off its regular price - in the TechSpot Store while the offer lasts.